Soak lasagne noodles in hot water. Peel and thinly slice the butternut squash. Melt the butter, stir in the flour and cook for 1-2 minutes. Stir in the milk and continue stirring until the sauce bubbles. Add the salt, pepper and nutmeg. Add grated cheddar, ricotta, beaten eggs and spinach and stir to combine. In a 9x13" pan, layer 3 sheets of lasagna, 1/3 of the squash and 1/3 of the sauce and repeat ending with noodles. Spread any remaining sauce over the top and sprinkle with Parmesan cheese (optional). Bake covered at 400 °F (205 °C) for 45 minutes, remove the foil and bake for an additional 15 minutes. Vegetarian, low carb, crustless spinach feta quiche. 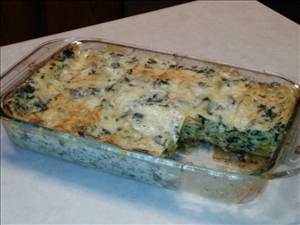 There are 435 calories in 1 serving of Butternut Squash & Spinach Lasagne. Calorie break-down: 43% fat, 36% carbs, 21% protein.